Dear colleagues, welcome to our new website! Please leave your comments, suggestions and feedback. I recently purchased the 150 templates pack and wanted to know if you had available pictures of every items included in it to have an idea of how the “finished” products look like beforehand. Pictures appearance boxes placed in the catalog. Some boxes do not have photos of their appearance, sorry. We work with that. Thanks for your professional and very informative website. Please note a spelling mistake in the heading “Resent Templates”, I believe you meant to write “Recent”. Shap, thank you for your remark! 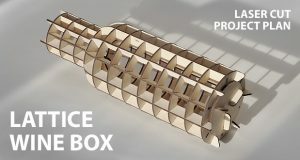 I comment you that I am looking for a factory that can produce me a box of corrugated cardboard. It is will be marketed by the company ANTHROPOMETRICA in Mexico to body measurements, so consumption will be on a monthly basis in large quantities, so need to reach a trade agreement and confidentiality. I hope your kind reply. Can you give me a e-mail for next comunications? Wow! I download the free pack and try a couple, astonishing easy and accurate, I will buy the 150 package soon. 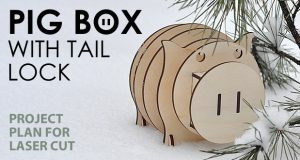 WE HAVE CO2 LASER CUTTING MACHINES WE WILL SEND 15$ TO YOU FOR PACKAGE DESIGNS FOR WOOD WE HOPE TO BE GOOD IN USE. 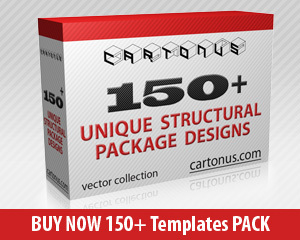 The Templates PACK – Structural package designs. Templates for cardboard and paper, not for wood. 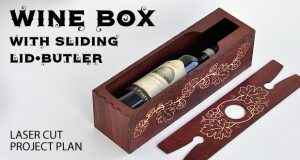 The card box file says to engrave a slot on the under side of the lid (between the slide locks). How is this done on the laser machine when everything is working from the top? We are looking at products we are able to create, and sell. Does the purchase of your files allow for manufacturing for distribution, or to sell? We are very interested if allowed to sell the final assembled products. Look forward to any info you can provide. You can’t resell our digital plans, templates, patterns. You can create and sell products using our files. Hello Cartonus team, I have downloaded and cut out a number of your designs in 3.2mm ply and MDF (Medite) and have been very impressed at the attention to the fit of your designs as I have not yet had a problem. I recently have adapted the Business Card Holder with sliding latch to a larger size for and special order and am impressed with the lattice hinge design that works in MDF as well. I have just seen today some new designs that you have posted on your website that I shall be downloading soon, I come back and visit from time to time because I love what you do. Christmas is coming and have plans to cut your tree decorations out in coloured acrylic, they should look amazing. A little tip for anyone who needs to work on both sides of a piece of work in a laser machine; Do the most important inscribing/engraving/cutting first, then using another piece of material fix this to the bed of your laser with tape in a position that you can repeat easily, set an origin point on the laser over the that material and inscribe an outline of your work that is a mirror image. Now place your original work over this outline so the reverse side is up (you may have to use a small amount of masking tape to keep it in place), re-focus the laser and then carry out the inscribing/engraving etc. that you want done. It works for me to double-side something. Just make a note on the inscribed blank what the origin x-y points are and it can be repeated time and time again. Thank you for what you do, from the UK. You guy”s are amazing. I have bought many of your products and the assembly process has never been easier. I really appreciate your products and can’t wait till more goes up. Thank you for a job well done! Hello Cartonus team. What awesome things you made! I’ m a rookie using laser cut machine. I’m finding ways to clean the surface of engraving or cutting. As you know, laser cutting will burn the surface of wood to black color. So one tell me white vinegar can clean it well but it seems not to make sense. I have watch some video in your website and find your product cleaning well. So I wanna know how you can do that and can you share the tips with me ? 1. Use a damp sponge to clean the surface of the material after laser cutting. 2. Cover the surface of the material masking tape. Remove masking tape after laser cutting. last week bought all the wine box from me, I am very satisfied. Hi,please can you tell me what is in the 150+ pack? Is it just paper templates or is it wood templates as well? It’s paper and cardboard templates. The files i’ll buy, and you send to me. Recognized my program from laserworks not. That’s are RLD files. what’s the solution? RLD – is file format of RDWorks project.